Fans of the popular Ubisoft video game, Assassin's Creed will not lose track of time again, especially after a long gaming sessions! 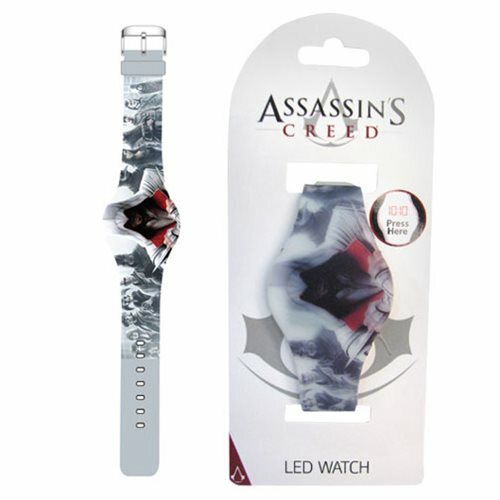 This Assassin's Creed Full Image LED Watch features Ezio and the band of characters from the Assassin's Creed 2 video game. At first glance, this watch resembles a sleek silicone wristband, but with a simple push of a hidden button on the face of the watch, a red LED time lights up to display the time! Total length of the watch measures about 9 1/2-inches long including face. The watch comes packaged on a firm cardboard backing. Ages 13 and up.